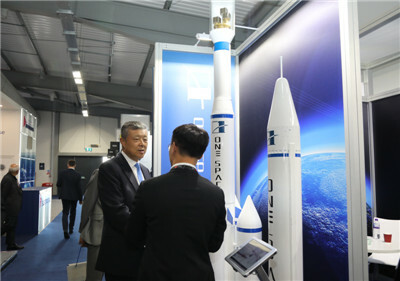 On July 16, Ambassador Liu Xiaoming was invited to visit the Farnborough International Airshow 2018, where he attended the Launch Ceremony for AVIC Cabin Systems and the Purchase Signing Ceremony between Commercial Aircraft Corporation of China, Ltd.(COMAC) and HNA Group. The Ambassador also met with Chinese business delegates, including Tan Ruisong, Chairman of the Board of Aviation Industry Corporation of China, Zhao Yuerang, President of COMAC, Zhao Quan, Member of the Board of Directors of HNA Group, and Wei Yiyin, Vice President of China Aerospace Science & Industry Corporation (CASIC), and exchanged views with the Chinese Exhibitors including One Space, Shandong Nanshan Aluminum Co., Ltd, and Sichuan Haite High-tech Co., Ltd. 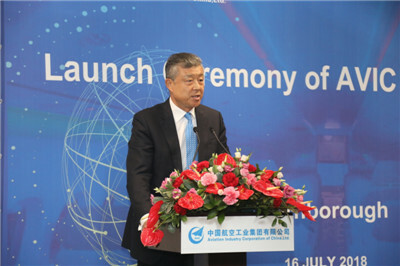 Ambassador Liu gave a speech entitled Deliver Win-Win Results for China-UK Cooperation on Aviation at the Launch Ceremony. He noted that China-UK cooperation on aviation has moved up to a new level due to the attentive care and active support of the governments of the two countries as well as the hard work of the aviation industries. The event will have a significant impact on the aviation sector in both China and the UK, and the world aviation development. It marks a new step in building the China-UK "air corridor", represents a higher level of China-UK cooperation on aviation,and offers new opportunities for China-UK cooperation on the Belt and Road Initiative. The Ambassador expressed the hope that the aviation companies from both countries could seize the opportunity to forge closer partnership, play an active role in building the Belt and Road and contribute their part to the China-UK "Golden Era". 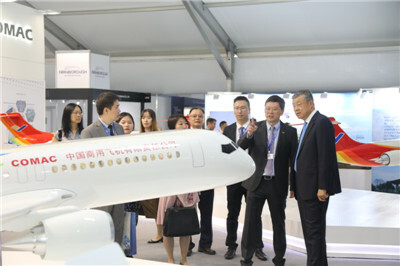 The Ambassador toured the models of the large passenger aircraft C919, regional jet ARJ21 and long range wide body Civil Aircraft CR929 at the exhibition booth of COMAC, and learned about COMAC's R&D, manufactures and marketing in civil aircraft industry and the research progress of the three aircrafts. 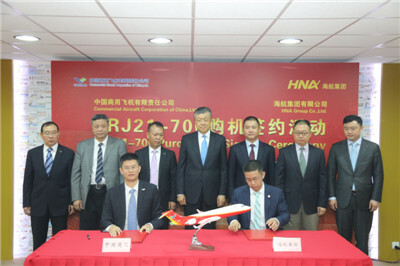 Witnessed by Ambassador Liu and other guests, COMAC and HNA Group's Urumqi Air signed a letter of intent to purchase twenty ARJ21-700 aircrafts. 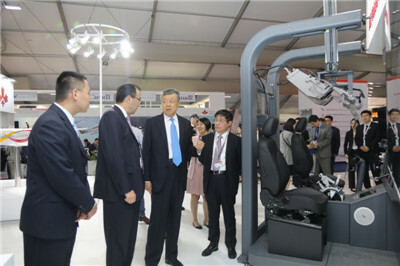 Ambassador Liu also visited the booths of other Chinese Exhibitors, including One Space, Shandong Nanshan Aluminum Co., Ltd, and Sichuan Haite High-tech Co., Ltd., learning in detail about the development of Chinese enterprises in the aviation field. He encouraged Chinese companies to strengthen exchanges and cooperation with the UK side to enhance technological innovation and R&D so as to upgrade their internationalization. After that, the Ambassador gave interviews to CCTV and Xinhua News Agency. The Farnborough International Airshow, organized by ADS Group, is a renowned exhibition in Aerospace, Defense, Security and Space Sectors. A total of 25 Chinese enterprises participated in this biennial exhibition this year.